Delta Queen blog and historyDescription: An online journal by Delta Queen historian Bill Wiemuth from aboard the Delta Queen chronicling life onboard, the Delta Queen's history, and her current struggle to survive. For one day, the media bubbled about a story that the City of Alexandria, Louisianawas negotiating to buy the Delta Queen. Bill Hess, Alexandria's economic development chief,said the boat would make a nice tourist attraction if she were permanently moored in thecity's downtown riverfront area. As soon as the GoogleNews alerts went out, the steamboatcommunity began to hammer Mr. Hess with emails, phonecalls, and tanks (just making that part up), and by mid-day the deal was off. Apologies to allfor any hurt feelings. This is an issue that Americans feel passionate about. The Savethe Delta Queen Campaign has a vision of finding new owners for the Delta Queen who will dowhat it takes to win the exemption. We want Ambassadors to keep the rest of their boats and keep them sailing. Ambassadors isa great cruise line, but they must admit that the Delta Queen is different from their other boats.Ambassadors/Majestic America needs to let go of this national treasure gently, and then continueproviding great cruise vacations all over the world. They have a fleet of gingerbreadMark Twain paddlewheel boats, which will benefit from the good publicity the Delta Queen (as thealpha steamboat) will generate for them. Our pal Gene Sloan has given us yet another story in USA Today.http://www.usatoday.com/travel/cruises/item.aspx?type=blog&ak=53739128.blogThank you! We love you Mr. Sloan!!! CINCINNATI - Senator George Voinovich (R-OH) has announced that when Congress reconvenes after Labor Day, he will introduce legislation to continue the Delta Queen's 40-year exemption from the Safety of Life at Sea Act. The exact language of the bill and the date of its introduction will be announced in late August or early September. The Delta Queen is the last traditional steamboat carrying overnight passengers on America's inland waterways. For that reason she has been designated a National Historic Landmark. In 1966, she was inadvertently caught in the technical provisions of the Safet yof Life at Sea Act - a piece of legislation that was intended to cover ocean-going ships, not riverboats. Recognizing the difference between boats that operate on rivers, within yards of the shore, and ships that sail the high seas, Congress established an exemption for the Delta Queen in 1968. Since then, the exemption has been renewed nine times, in virtually every case by near-unanimous votes in both the House and the Senate. Without congressional action, the current exemption will expire on November 1, 2008. Bipartisan legislation to extend the exemption, H.R. 3852, was introduced by Congressman Steve Chabot (R-OH) on October 16, 2007. It remains in the House Committee on Transportation and Infrastructure because Committee Chairman James Oberstar of Minnesota refuses to release it to be voted on by the entire House of Representatives. Vicki Webster, leader of the grassroots Save the Delta Queen Campaign, said, "We're thrilled that Senator Voinovich has started the ball rolling in the Senate and look forward to working with him and his staff in the days ahead. Public support for our effort is growing by the day. We are confident that members of Congress will respond to the wishes of their constituents and vote to keep the Queen alive and plying the rivers for generations to come." The California-based company that owns the Delta Queen confirmed Wednesday that multiple bidders are pursuing a purchase of the historic riverboat with the goal of keeping the 174-passenger vessel in the overnight cruise business beyond this year. "We lost the battle in Congress by just a few votes. So, we don't have the right to operate her beyond Oct. 30. However, there are people who believe that under their ownership, they could get the exemption for another 10 years and operate," said Joseph Ueberoth, CEO of Ambassadors International Inc., in a conference call on the company's second-quarter earnings results. The Delta Queen's future is in jeopardy because of a refusal by Congress to renew a decades-old exemption to federal fire safety rules banning the use of wooden boats for overnight cruises. Newport Beach, Calif.-based Ambassadors (NASDAQ: AMIE) put the Delta Queen and six other boats up for sale in April, hoping to generate cash that could be used to pay off debt, buy back shares and invest in other business lines. The need for cash grew stronger Wednesday, as Ambassadors announced a net loss of $2.4 million, or 22 cents per share, on revenue of $80.6 million for the three months ended June 30. Both its revenue and profit figures were lower than two analysts polled by First Call/Thomson Financial had projected. Ueberoth provided an update on the sale process but declined to identify any potential buyers. "The parties are finishing their vessel inspections and due diligence," he said. "We still cannot confirm the scope of the sale, the numbers of transactions we anticipate or if we will be successful in this process. It is our desire to bring this process to a close in the third quarter." Congressman Oberstar of Minnesota, who opposes the Delta Queen, now has a pro-Delta Queencontender for his seat in the House. Michael Cummins is the Republican's nominee andhe wants to save the Delta Queen (http://www.cumminsforcongress.com).He would not become the new head of the TransportationCommittee, but voting Oberstar out would open the chairmanship for somebody new, who may bemore honest, lucid, and patriotic than Oberstar. It is ironic that you have chosen Mark Twain as your cover story of the week at a time when an institution for which he had little respect - the United States Congress - is on the brink of destroying the only remaining link to the era that inspired his greatest work. The Delta Queen, the last authentic steamboat carrying overnight passengers on our inland waterways, is on the brink of being put out of operation because Congress is cowering before James Oberstar, the all-too-powerful chairman of the all-too-powerful Committee on Transportation and Infrastructure, who for reasons of his own wants to destroy this National Historic Landmark. I currently am running against Mr. Oberstar in the 8th District of Minnesota, and I continue to hear from those who love and appreciate the Delta Queen. 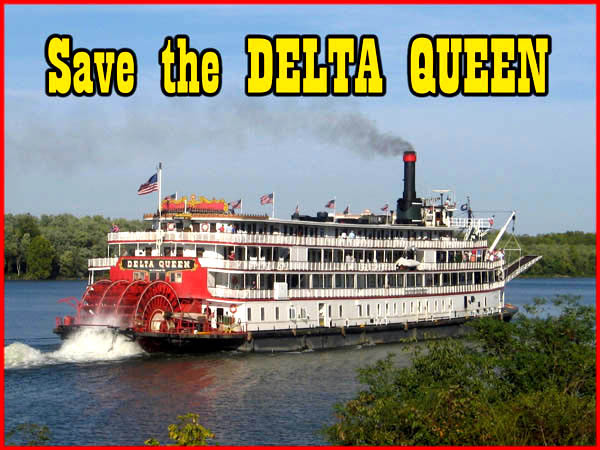 I have heard from all four corners of the country and they are all saying the same thing: Save the Delta Queen. It amazes me how we have gotten to the point in this country where we are willing to allow our historical icons to fall by the wayside for political gain. That is not the America that I love and appreciate. If we do not protect our treasures in this country from special interests, then we are basically removing history from the hearts and minds of the American people. We need to stand up for America and we need to stand up for those who need our help and, yes, that includes steamboats. Congress is a bunch of grown up children and it is about time that they start acting their age. Is it any wonder that the Congress has a 15% approval rating in this country? The Delta Queen got serious national TV coverage for the first time on Friday July 18 on Fox News.This report features Congressman Oberstar lying about the Delta Queen.For a more in-depth analysis of this broadcast, go to Cruisemates.com - click here article by Paul Motter. Franz Neumeier (Steamboats.org &Save-the-Delta-Queen.com) reminds us all to write to the Time editors about saving the Delta Queen. John R. Weise sends this recent photo of our Queen leaving theWillow Island Lock about ten miles above Marietta. The cooling towers in the backgroundare not for a nuclear power plant. All power plants have cooling towers of one design or another. My name is Charles Greene. My dad, Robert Greene, was ferried off to his WWII troop ship in San Francisco Bay aboard the Delta Queen, which then returned loaded with wounded troops. My dad came back from the war. Far too many did not. In 1947, my grandfather's cousin, TomGreene, bought the Delta Queen, had her towed from California to Cincinnati, and put her into operation carrying passengers up and down the Mississippi River and its tributaries just as steamboats had done for more than 100 years. 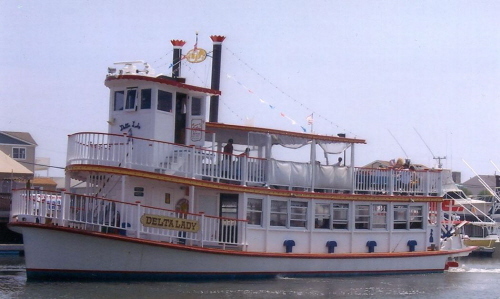 Today the Delta Queen is the only remaining genuine steamboat carrying overnight passengers on our inland waterways. On her travels, she brings much-needed tourist revenue to many river towns, which will now be needed all the more after the devastating effects of the recent floods on the Mississippi and Ohio Rivers. Yet now some members of Congress want to put her out of business because she doesn't comply with a provision of a law that was never intended for riverboats. The Delta Queen survived being towed through the Panama Canal without incident, and has served honorably and faithfully for more than 80 years without any serious safety incidents. The Delta Queen survived the recession that followed the attacks of 9-11, and Hurricane Katrina (although her then-owners did not). She is surviving $140/bbl oil. But there is a good chance that the Delta Queen cannot survive her most lethal challenge to date: the inaction of Congress. Without an exemption to legal restrictions due to her wooden superstructure, this will be her last season. To some in Congress the facts do not matter. They care only about the letter of a misapplied law. So to all of you I ask this question: Come July 4th, just what the hell are we celebrating? MARIETTA, OH (June 3, 2008) - A special "Save the DELTA QUEEN" steamboat rally will take place Thursday, June 12 beginning at 11:30 a.m. along the Ohio River Levee at the corner of Front and Greene Streets in Marietta. According to a Majestic America Line press release the historic steamboat DELTA QUEEN has been denied a renewal of her exemption from Safety of Life at Sea (SOLAS) regulations by the US Congress. 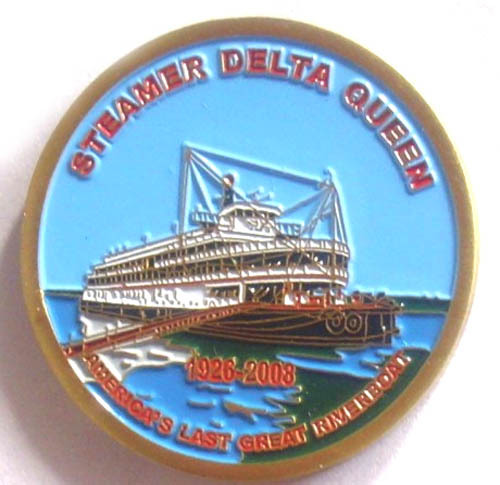 This means the Steamer DELTA QUEEN will not be allowed to serve as an overnight passenger vessel after the actual exemption from the law expires in November 2008. 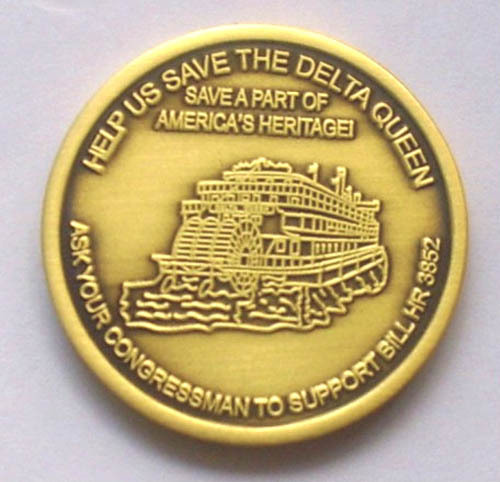 Steamboat enthusiasts in states along the boat's route have started a campaign to save the DELTA QUEEN and find a way to gain an exemption. 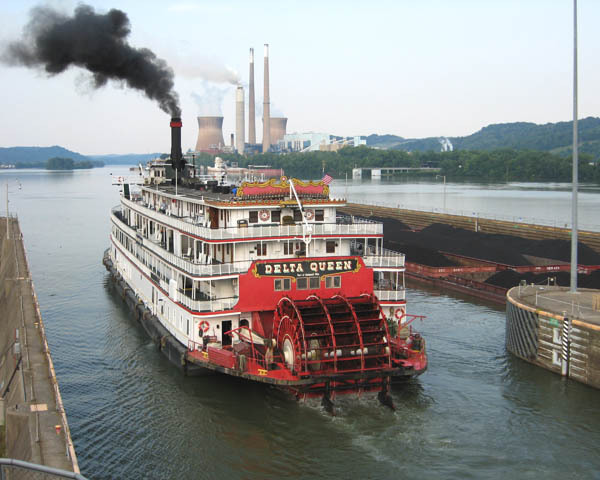 The June 12th rally is open to the public and will feature speakers from the American Sternwheel Association, Senator Joy Padgett, state and local government representatives, and other noted officials. Musical entertainment will feature Tony Ellis, banjo player formerly with Bill Monroe's Bluegrass Boys and the Ralph Stanley Band, and Mayor Michael Moon Mullen, as well as the barbershop quartette harmony of the Treblemakers. WMOA Radio will host a live radio remote during the rally. Other regional media professionals will be in attendance covering the event as well. The public is encouraged to bring their lunch to the levee and join in the rally. 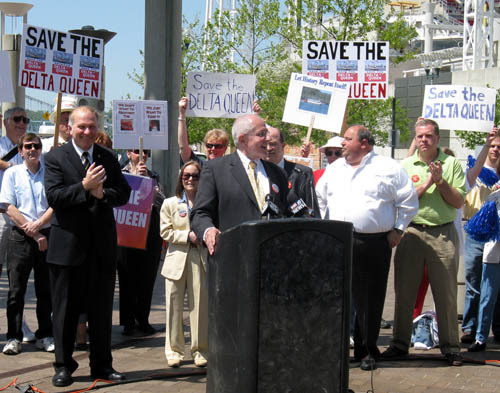 Petitions in support of Congress continuing to exempt the DELTA QUEEN from the SOLAS regulations will be circulated during the rally for signatures. 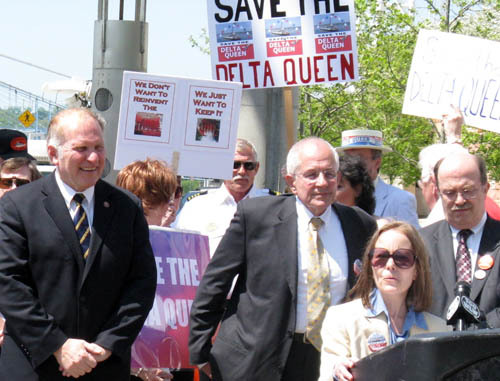 The petitions will be delivered to Congress by Save the Delta Queen campaign representatives. The DELTA QUEEN is America's oldest operating overnight steamboat. She was built in 1927, is listed on the National Register of Historic Places, and is a designated National Historic Landmark. To learn more about the grass-roots effort visit www.save-the-delta-queen.org, or contact Kelly Blazosky, CVB Executive Director, Marietta, Washington County CVB office, 740-373-5178; or Vicki Webster of the Save the Delta Queen Campaign at 513-381-3571 or email. For larter, printable posters, click here. The Delta Queen will be on hand for all three of these events.Please urge everyone you know to come out and join us! 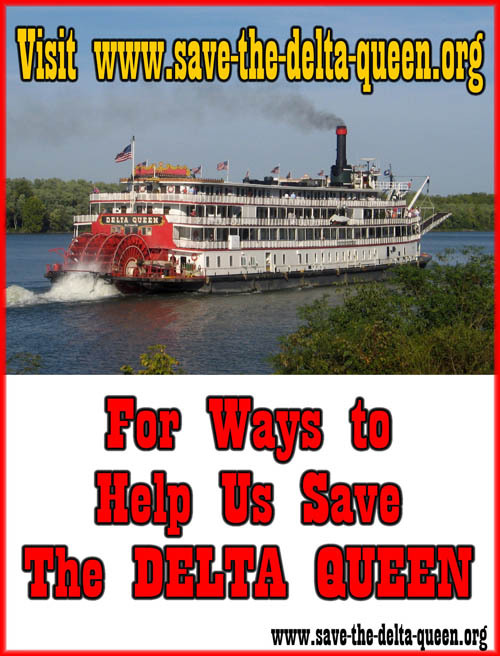 Help save the Delta Queen! 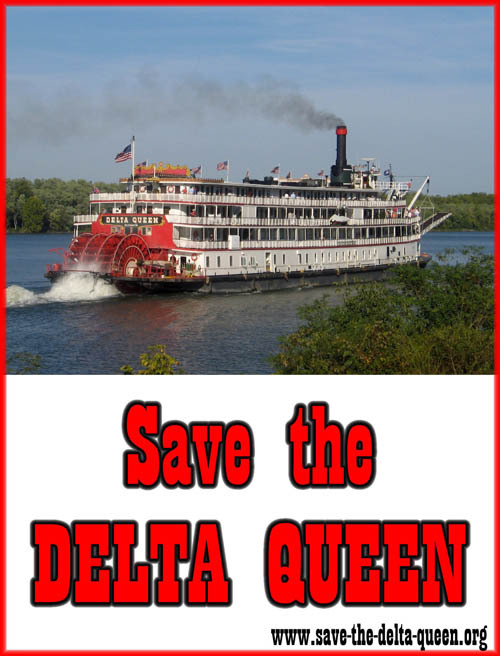 Join the Save the Delta Queen Phone Tree - click herefor more information. Call your two U.S. Senators and your U.S. Representative. 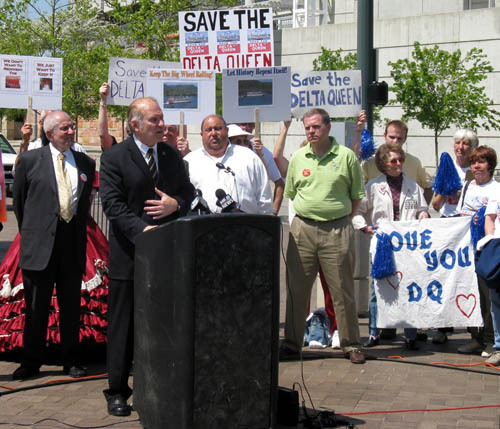 Ask them to save the Delta Queen,a worthy national landmark. The 2008 Online Steamboat Race is now posted: click here. 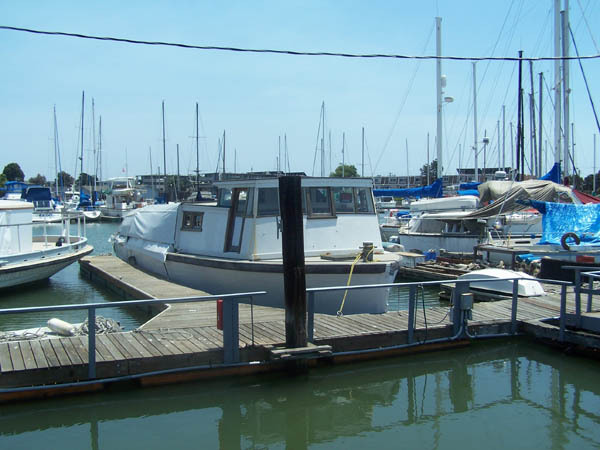 Editor's Note: We received word December 14, 2008 that this boat is now SOLD. My name is Desiree Williams and I am looking to sell our replica paddlewheeler the Delta Lady.I have attached her specs and a photo.Her current home is here in Fort Myers FL.The owner is asking $250k but is willing to negotiate. We are hoping to find a buyer that will love her as much as we have. Boat for Sale - the "Victory 1"
On June 14, we went to San Rafael (North San Francisco Bay Area), to consider asixty-five-foot water taxi that is for sale. The location is the main attraction -the marina is adjacent to the progressive downtown area of San Rafael, which iswalker friendly, and they have street festivals and farmers markets. Marina / slipfees are $450 per month and the boat itself is $22k. It would be perfect for someonewho wants to live in a community of $1m+ homes, for under $1k a month. 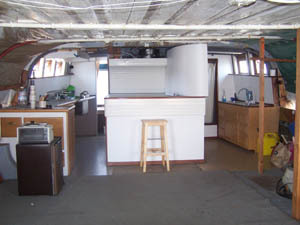 The current owner installed a galley and head (no toilet, but the marina facilities are nearby). 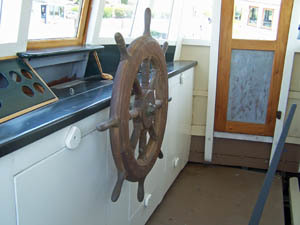 This isthe wheel house. It is a working boat. The indoor cabin area is large enoughfor living quarters for one or two people, but needs to be remodeled. I loved the idea of achallenge like this, but the weather is too cold forme (I live near Phoenix, Arizona, and love the warm climate).Redoing the boat will take a while - better plan to do it over a summer, whenthe days warm up pretty well. If a primary residence or vacation home on a boat inwalking distance to a tony Bay Areadowntown area sounds like your dream come true, contact Brad. 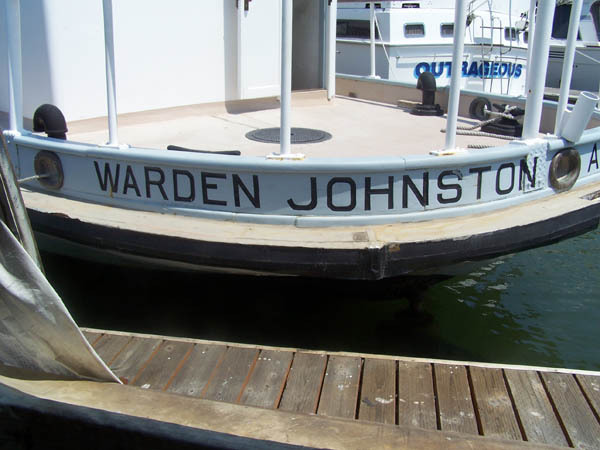 His other boat is a historic water taxi, the Warden Johnston. He would consider selling this one,but no price is set, and he has not put it on the market yet. He said he woud like to"focus on selling the Warden as a business opportunity inthe non-profit sector, it fits the bill in all the important 501(c)3 criteria. "The boat was used to ferry passengersto and from Alcatraz and could go back into service - this time for tourists. Here is a PDFwith the entire history of the boat, along withadditional photos: http://wardenjohnston.com/share/wj-photo-doc-folio.pdf - click here for Warden Johnston history. Sorry, no paddle wheels on these two, but they are worthy vessels!Contact Brad emailor phone 415-302-0103. Its official - Loyalhanna Dockyard was awarded the Hartman Fiberglass line & expect to be selling the DQ kits later this summer. Feel free to spread the word on your site. BTW, I was advised yesterday by another hobbyist that Saito has discontinued their DQ kit, but I've not seen anything official from Loyalhanna who carries the Saito line. If so, the awarding of Hartman today is very good news for anyonewho wants to build the Delta Queen! We would like to announce that the Company formerly known as Hartman Fiberglass R/C, owned and operated by Dwight Hartman, has found a permanent home. With the passing of Mr. Hartman, the continuation of his legacy and specialized line of Fiberglass Hulls & Accessories has been of concern to many. Loyalhanna Dockyard has officially won the bid for the purchase of Hartman Fiberglass R/C and we are getting ready to move the facility to the Western New York area. We are expecting it to take several weeks to be up and running efficiently, but we will be updating everyone as we make progress. We are very excited and looking forward to not only offering the entire Hartman line but also adding to the line. We will be designing a new Catalog just for the Hartman line and also building a website. Renee will be hard at work putting these together in the upcoming weeks. Please keep checking the website(s) for updates and feel free to email us or contact us with questions. Looking for Delta Queen employees who worked on the boat between the years of 1975 and 1985.A reunion is being planned in Cincinnati the weekend of June 6, 2008. For further informationcontact Tracey Smith - click here. Click here for other recent steamboat news.